Most modern desktop personal computer power supplies conform to the ATX specification, which includes form factor and voltage tolerances. While an ATX power supply is connected to the mains supply, it always provides a 5 Volt standby (5VSB) voltage so that the standby functions on the computer and certain peripherals are powered. ATX power supplies are turned on and off by a signal from the motherboard. They also provide a signal to the motherboard to indicate when the DC voltages are in spec, so that the computer is able to safely power up and boot. The most recent ATX PSU standard is version 2.31 of mid-2008. The desktop computer power supply changes alternating current from a wall socket to low-voltage direct current to operate the processor and peripheral devices. Several direct-current voltages are required, and they must be regulated with some accuracy to provide stable operation of the computer. A power supply rail or voltage rail refers to a single voltage provided by a power supply unit (PSU). Although the term is generally used in electronic engineering, many people, especially computer enthusiasts, encounter it in the context of personal computer power supplies. First-generation microcomputer and home computer power supply units used a heavy step-down transformer and a linear power supply. Modern computers use switched-mode power supplies (SMPS) with a ferrite-cored high frequency transformer. The switched-mode supply is much lighter and less costly, and is more efficient, than an equivalent linear power supply. Computer power supplies may have short circuit protection, overpower (overload) protection, overvoltage protection, undervoltage protection, overcurrent protection, and over temperature protection. Recent power supplies have a standby voltage available, to allow most of the computer system to be powered off. When the computer is powered down but the power supply is still on, it can be started remotely via Wake-on-LAN and Wake-on-ring or locally via Keyboard Power ON (KBPO) if the motherboard supports it. This standby voltage is generated by a smaller power supply inside the unit. In older PSU designs, it was used to supply the voltage regulator, located on the low-voltage side of the transformer, allowing the regulator to measure output voltages. The regulator controls the switching transistors insulated by optocouplers or pulse transformers. The standby power source was a small linear power supply with conventional transformer, which was later changed to a switching power supply, sharing some components of the main unit due to cost- and energy-saving requirements. This 5VSB (Five Volts StandBy) power output feeds devices operating in standby or power off is generated by this small circuit, which replaced a small convertional transformer or startup circuit for the main voltage regulator, until it can generate power output, in some designs feeding itself and substituting the 5VSB. For this reason, a detected shoutcut may cause to wait up to an hour, until it can successful power up again. This meantime is defined by the grid side located filter capacitors have been discharged by the installed bleeding resistors. The +12 V supply was used primarily to operate motors such as in disk drives and cooling fans. As more peripherals were added, more power was delivered on the 12 V rail. However, since most of the power is consumed by chips, the 5 V rail still delivered most of the power. The −12 V rail was used primarily to provide the negative supply voltage to the RS-232 serial ports. 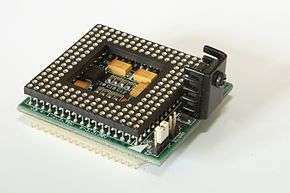 A −5 V rail was provided for peripherals on the ISA bus, but was not used by the motherboard. 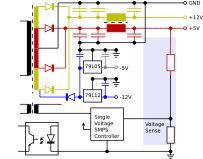 Voltage converter for 80486DX4 processors (5 V to 3.3 V). Note the heat sink on the linear regulator, required to dissipate the wasted power. 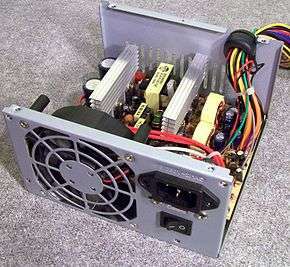 A typical installation of an ATX form factor computer power supply. These voltage supplies are rarely a limiting factor; generally any supply with a sufficient +12 V rating will have adequate capacity at lower voltages. However, a large quantity of hard drives or PCI cards will create a greater load on the +5 V rail. Most older CPUs including some 80486 variants and logic devices on the motherboard were designed for 5 V operating voltage. Power supplies designed for that generations of computers control the 5 V output rail precisely and supply the 12 V rail in a specified voltage window depending on the load ratio of both rails. The 12 V was used for fan motors, drive motors and serial interfaces also using the −12 V supply. A further use of the 12 V came with the sound cards, using linear chip audio power amplifiers, sometimes filtered by a 9 V linear voltage regulator on the card to cut the noise of the motors. Since certain 80386 variants, CPUs use lower operating voltages such as 3.3 or 3.45 V. Motherboards were equipped with linear voltage regulators, supplied by the 5 V rail and configurable by jumpers or dip switches in selectable output voltages to fit the installed CPUs specifications. As newer generations of CPUs required higher currents and larger heat sinks, soon to be superseded by switching mode voltage regulators like buck converters. Standard ATX power supplies were required to deliver 3.3 V. This voltage is generated by shifting and transforming the pulses of the 5 V rail on an additional choke, causing the voltage to rise delayed and rectified separately into a dedicated 3.3 V rail. Cutting the pulse by the voltage regulator the rato of the 3.3 and 5 V is controlled. Some cheap designed PSUs with lower maximum output used a linear regulator to generate 3.3 V from the 5 V converting the product of voltage drop and current to heat. With the Pentium 4 and newer computer generations, the voltage for the CPU cores went below 2 V. Voltage drop on connectors forced the designers to place such buck converters next to the device. Higher maximum power consumption required the buck converters no longer fed from the 5 V and changed to a 12 V input, to decrease the amperage required from the power supply. A small linear voltage regulator is installed in some drives to keep the +3.3 V stable by feeding it from the +5 V rail. This is a safety limit on the amount of power that may pass, in case of a fault, through any one wire. That much power can significantly overheat a wire, and would be more likely to melt the insulation and possibly start a fire. Each wire must be current-limited to no more than 20 A; typical supplies guarantee 18 A without triggering the current limit. Power supplies capable of delivering more than 18 A at 12 V connect wires in groups to two or more current sensors which will shut down the supply if excess current flows. Unlike a fuse or circuit breaker, these limits reset as soon as the overload is removed. Ideally, there would be one current limit per wire, but that would be prohibitively expensive. Since the limit is far larger than the reasonable current draw through a single wire, manufacturers typically group several wires together and apply the current limit to the entire group. Obviously, if the group is limited to 240 VA, so is each wire in it. Typically, a power supply will guarantee at least 17 A at 12 V by having a current limit of 18.5 A ± 8%. Thus, it is guaranteed to supply at least 17 A, and guaranteed to cut off before 20 A. These groups are the so-called "multiple power supply rails". They are not fully independent; they are all connected to a single high-current 12 V source inside the power supply, but have separate current limit circuitry. The current limit groups are documented so the user can avoid placing too many high-current loads in the same group. Originally, a power supply featuring "multiple +12 V rails" implied one able to deliver more than 20 A of +12 V power, and was seen as a good thing. However, people found the need to balance loads across many +12 V rails inconvenient. When the assignment of connectors to rails is done at manufacturing time it is not always possible to move a given load to a different rail. Rather than add more current limit circuits, many manufacturers have chosen to ignore the requirement and increase the current limits above 20 A per rail, or provide "single-rail" power supplies that omit the current limit circuitry. (In some cases, in violation of their own advertising claims to include it.) The requirement was deleted from version 2.3 (March 2007) of the ATX12V power supply specifications. The overall power draw on a PSU is limited by the fact that all of the supply rails come through one transformer and any of its primary side circuitry, like switching components. Total power requirements for a personal computer may range from 250 W to more than 1000 W for a high-performance computer with multiple graphics cards. Personal computers usually require 300 to 500 W. Power supplies are designed around 40% greater than the calculated system power consumption. This protects against system performance degradation, and against power supply overloading. Power supplies label their total power output, and label how this is determined by the amperage limits for each of the voltages supplied. Some power supplies have no-overload protection. The system power consumption is a sum of the power ratings for all of the components of the computer system that draw on the power supply. For certain graphics cards, the PSU's 12 V rating is crucial. If the total 12 V rating on the power supply is higher than the suggested rating of the card, then that power supply may fully serve the card if any other 12 V system components are taken into account. 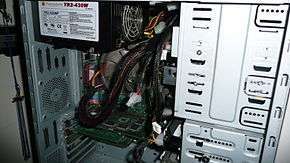 The manufacturers of these computer system components, especially graphics cards, tend to over-rate their power requirements, to minimize support issues due to too low of a power supply. Although a power supply with a larger than needed power rating will have an extra margin of safety against overloading, such a unit is often less efficient and wastes more electricity at lower loads than a more appropriately sized unit. For example, a 900-watt power supply with the 80 Plus Silver efficiency rating (which means that such a power supply is designed to be at least 85-percent efficient for loads above 180 W) may only be 73% efficient when the load is lower than 100 W, which is a typical idle power for a desktop computer. Thus, for a 100 W load, losses for this supply would be 37 W; if the same power supply was put under a 450 W load, for which the supply's efficiency peaks at 89%, the loss would be only 56 W despite supplying 4.5 times the useful power. For a comparison, a 500-watt power supply carrying the 80 Plus Bronze efficiency rating (which means that such a power supply is designed to be at least 82-percent efficient for loads above 100 W) may provide an 84-percent efficiency for a 100 W load, wasting only 19 W.
A power supply that is self-certified by its manufacturer will claim output ratings that may be double or more than what is actually provided. To further complicate this possibility, when there are two rails that share power through down-regulating, it also happens that either the 12 V rail or the 5 V rail overloads at well below the total rating of the power supply. Many power supplies create their 3.3 V output by down-regulating their 5 V rail, or create 5 V output by down-regulating their 12 V rails. The two rails involved are labeled on the power supply with a combined amperage limit. For example, the 7000500000000000000♠5 V and 7000330000000000000♠3.3 V rails are rated with a combined total amperage limit. For a description of the potential problem, a 3.3 V rail may have a 10 A rating by itself (7001330000000000000♠33 W), and the 5 V rail may have a 7001200000000000000♠20 A rating (7002100000000000000♠100 W) by itself, but the two together may only be able to output 110 W. In this case, loading the 3.3 V rail to maximum (33 W), would leave the 5 V rail only be able to output 77 W.
Various initiatives are underway to improve the efficiency of computer power supplies. Climate Savers Computing Initiative promotes energy saving and reduction of greenhouse gas emissions by encouraging development and use of more efficient power supplies. 80 PLUS certifies power supplies that meet certain efficiency criteria, and encourages their use via financial incentives. Efficient power supplies also save money by wasting less power; as a result they use less electricity to power the same computer, and they emit less waste heat which results significant energy savings on central air conditioning in the summer. The gains of using an efficient power supply are more substantial in computers that use a lot of power. 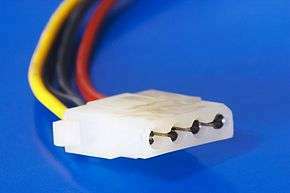 4-pin Peripheral power connectors: These are the other, smaller connectors that go to the various disk drives of the computer. Most of them have four wires: two black, one red, and one yellow. 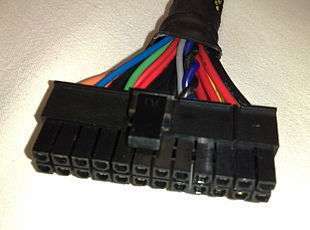 Unlike the standard mains electrical wire color-coding, each black wire is a ground, the red wire is +5 V, and the yellow wire is +12 V. In some cases these are also used to provide additional power to PCI cards such as FireWire 800 cards. Serial ATA power connectors: a 15-pin connector for components which use SATA power plugs. This connector supplies power at three different voltages: +3.3, +5, and +12 V.
A semi modular power supply to the left and a non-modular power supply to the right. 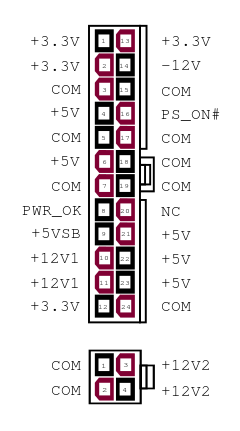 ↑ In the 20-pin connector, pins 13–21 are numbered 11–20 respectively. ↑ Formerly −5 V ( white wire), absent in modern power supplies; it was optional in ATX and ATX12V ver. 1.2 and deleted since ver. 1.3. ↑ Torres, Gabriel (2008-03-15). 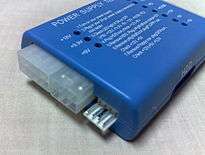 "How Much Power Can a Generic 500 W Power Supply Really Deliver?". Hardwaresecrets.com. Retrieved 2009-03-28. Our generic 500 W power supply died when we tried pulling 275 W from it, so the maximum amount of power we could extract was 250 W – half the labeled amount! 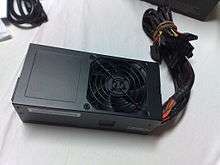 ↑ "OCZ GameXstream 700 W Power Supply, Hardware Secrets". Retrieved 2008-04-20. ↑ "High-Performance Power Supply Units". Tom's Hardware. ↑ "Power Supply Design Guide for Desktop Platform Form Factors, Revision 1.31" (PDF). Intel. April 2013. p. 26. Retrieved February 6, 2015.